This post is co-authored by Bruce Haupt, Performance Improvement Director for the City of Houston, and Jeff Reichman, Principal at January Advisors. View the original post here. 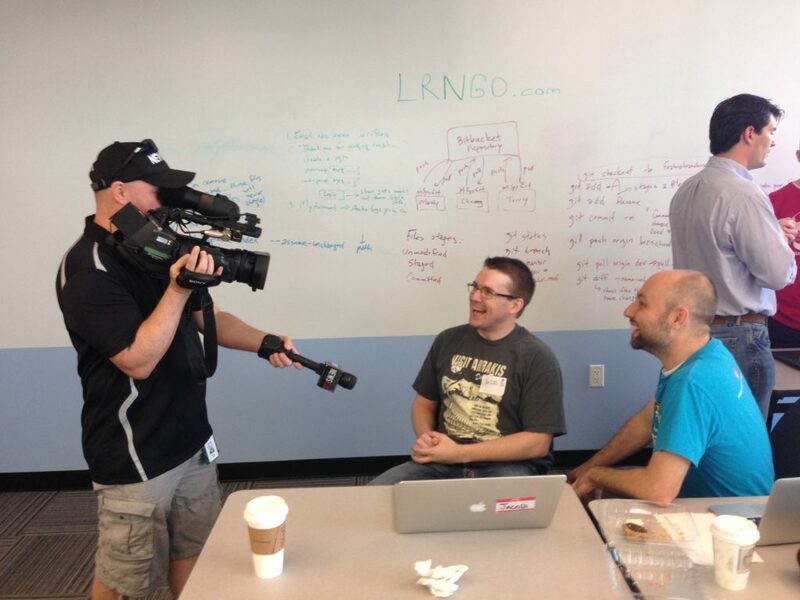 This is the story of how we planned and pulled off the first City of Houston Hackathon. It’s a story that has an ensemble cast filled with software developers, policy wonks, civic innovators, bagels, and bahn mi. Here’s a video. It would not have been possible without the support and leadership of Mayor Annise Parker and Council Member Ed Gonzalez. In an election year, endorsing anything with “hack” in the title could be seen as a political liability, but they did it anyway. We are grateful for that. Like so many good stories, this one began at a bar. I walked in to the Ginger Man in Houston’s Rice Village after work on Monday, December 3rd to meet with Jeff Reichman of January Advisors. We shook hands, ordered beers, and Jeff asked me to tell my story. I told mine and then Jeff told his. I had no idea how much time we’d spend together over the next six months because of this conversation. Jeff is a storyteller at heart. While his work centers on innovation and startup consulting, he has a background in writing. One conversation with Jeff will leave you thinking about the larger narrative that you fit into. Beyond the startups he’s launched and those he works with now, Jeff also serves as Houston Chair for Startup America. Jeff’s goal is to tell the story of Houston’s startup and technology ecosystem, and interweave the stories of our varied and disconnected communities to highlight the great things going on in our City, the fourth largest in the United States. Bruce and I first met at Startup Weekend Houston last November. Bruce’s team earned a first place finish for a clean little webapp that streamlined the business permitting process. I loved the idea of making it easier to “do business” with the government, and I was surprised and happy that someone from the City would actually participate in the event. About ten years ago, I was working for a startup, writing proposals, and building out a municipal sales organization. The first thing I learned was that the procurement process was totally busted, and I geeked out on ways to fix it. Even back then, it wouldn’t have been difficult to build a lightweight website to manage the RFP process. And while technology is no longer a barrier, the problem still exists today. Across all of our local governments, we don’t have enough people in power who know how to source and implement current technologies. Change is always risky, and there always seems to be a reason to say no. So I really admired Bruce and his team for picking a problem and spending their weekend showing us what’s possible with a little bit of code and a lot of common sense. New York City held a hackathon. Boston held a hackathon. Austin held a hackathon. Even the White House held a hackathon. Civic technology groups are springing up around the country. Most important from my perspective, I had just seen what a team of civic technologists could create in a day at Houston Startup Weekend. I was surprised by the product our small team developed in 24 hours versus the 1-2 year long multi-million dollar IT projects I was familiar with. Perhaps long term, ultra-expensive IT is the norm in governments and large corporations, but like Neo after taking the blue pill, my world had changed and I saw another way. If hosting a hackathon could generate customized, citizen-centric solutions for government, provide others the same life-changing epiphany I’d just experienced, and help unite and showcase Houston’s tech community – then checkmate: Jeff and I were committed to making a hackathon happen. A hackathon? No problem. Various groups around town had been holding hackathons every month for at least a year. I learned a few lessons as a constant observer and occasional participant. But a City of Houston Hackathon? It had to be big, exciting, and unique. With a handshake and a fresh round, I committed to the project. We would need to prepare datasets, and we’d need a venue, some food, a website, a marketing plan, and lots of other little things. Together, Bruce and I divvied up the work. And maybe I was feeling confident from what I’d seen at other hackathons, or maybe it was just the giddy feeling of three beers and a new project, but somehow I put myself on the line for at least 150 registrations. I went home that night very excited and a little nervous. Bruce and Jeff wear ties. Photo by Jerry Peruchini. We began canvassing our respective circles. After speaking with Mayor Parker’s senior staff, I learned that several people were interested in pursuing open data and open innovation initiatives like hackathons. Andy Icken, the City Chief Development Officer, connected us with Council Member Ed Gonzalez and his Chief of Staff Jerry Peruchini. Without strong executive support from their team and the Mayor, our story would have ended. Behind the scenes, Bruce pulled all of the right project stakeholders together. Through his preliminary discussions, we’d caught wind of another event being planned by Council Member Gonzalez and his innovation committee. They wanted to showcase Houston’s vibrant technology and startup communities, and we were invited to join their planning committee. We met with Council Member Gonzalez’s planning committee for two hours in a City Council board room. We reconciled our ideas and the vision for what we could do together. 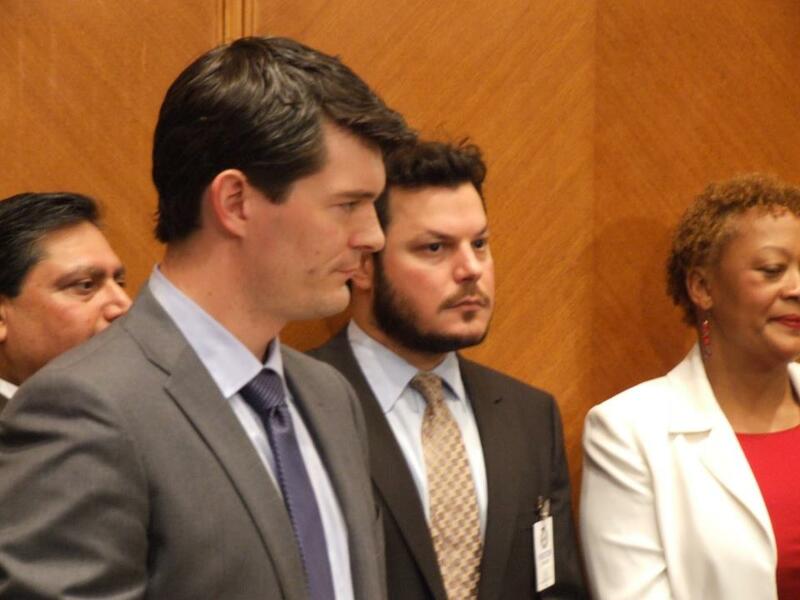 We agreed that the City of Houston Hackathon could serve as the first step towards a larger event in the fall. At the same time, we could also launch a whole series of initiatives and build upon the legacy of innovation and technology that exists in Houston. While Bruce worked on securing the project stakeholders inside the City, I lined up the event logistics, figured out how to make good on the 150 developer promise, and built us a website. Nothing makes it more real than putting it on the internet. A short while later, I was having breakfast with Walter Ulrich of the Houston Technology Center. We were discussing all of the changes in the Houston startup community, and what HTC could do to support the grassroots community initiatives. In an extremely generous move, he offered the Houston Technology Center as the venue for the hackathon. By early March, and with a venue, a website, and some sample projects in hand, we were ready to start marketing the event. But the City wasn’t going to officially announce the hackathon until May 1. With the event scheduled for May 18, that would only leave us about two weeks to drive registrations. It just wasn’t enough time. So I shared the website on Facebook. And I’m glad that I did, because through the help of J.R. Cohen, Marc Nathan, the Houston Startups Facebook group, Code for Houston, Hack Houston, REDLabs and others, we had a core group of developers long before the official announcement. Mayor Parker officially announced the event on May 1 at a press conference in City Council chambers. We stood behind the Mayor and CM Gonzalez. Every so often, we spoke into a gaggle of fuzzy microphones. The Mayor and Council Member Gonzalez were excited to see their innovative concept come to life. They spoke of Houston’s surging economy and the number of high tech engineers and software developers that live here. Houstonians find energy miles below the ocean, are trailblazing in renewable energies (energy capital of the world), and we pioneer cardiac and cancer therapies in the Texas Medical Center (the largest medical complex in the world). We’re no slouch when it comes to computer hardware and software technologies either. The hackathon was just one more opportunity to capitalize on the strengths of this City’s very talented and techie population to help solve real world problems. Friday, we party. Saturday, we work. I was at SXSW in March, and I was inspired by a hackathon planned by Natalie Reichstein at T3. She combined a parking lot party outside (food trucks, live music, and kegs of craft beer) with a quiet, comfortable hackathon inside. We hadn’t yet tried the party + hackathon concept in Houston. So I contacted Apurva Sanghavi and Guarav Khandawal, the two co-founders of the East End coworking space START Houston, to see if we could use their venue. We would throw a blowout party on Friday night before the Saturday hackathon, and developers could stay there all night if they wanted. They were excellent hosts, providing venue space as well as food. We packed the place. It helps when you have beer, pizza, and music. Many thanks to Tom Paynter and Second Lovers for the live music, Rassul Zarinfar and Buffalo Bayou Brewing Company for the beer, Council Member Gonzalez for attending and speaking, and everyone for showing up and having a good time. I have to admit, I really love the blueprint of party + hackathon. We were able to draw out lots of people who were not going to participate in the hackathon, but they were curious, or they had developer friends, or they just wanted to hang out with 200 nerds, drink craft beer, eat some pizza, and listen to some great live music. I fit squarely into that last camp. Of course we did. Photo by Jose Figueroa. We had a lot of volunteers and participants from inside and outside the City working on the hackathon, and, luckily, we had a lot of support from my team as well. Even with a party Friday night, many of us jumped out of bed at 5:30 AM on Saturday morning (maybe slowly ambled?) to get to the Houston Technology Center. Leading this charge was Meredith Mulford from my team at the City. Even with Jeff and me pulling her into the fray a week beforehand, she was able to funnel everything into a clear schedule for the event, assigning a point person for every moving part, and anticipating problems before they became problems. This was no small task. From the morning through late in the evening after everyone else had left to the after party, Meredith was there, behind the scenes, making it happen. Many people will remember MC Omar El-Halwagi. Omar also works on my team and served as our energetic and hilarious emcee for the hackathon. Like Meredith, he was drafted a week in advance and we asked him to put together speaking notes, bios, a judging process, and all manner of other needed details. Most of the projects could not have come into existence without the data on the Houston Data Portal. Gerald Rich of Code for Houston setup the data portal and Frank Bracco from my team led the effort of approving and loading data with the City IT, Planning, and Legal Departments. Jesse Bounds and Will White were very important contributors as well – on both the data and the projects. Without all these people and all hands on deck, we would not have had the 215+ datasets available (all obtained and loaded in the three weeks prior to the event). Teams get down to work on Saturday at the Houston Technology Center. Photo by Jose Figueroa. Justin Concepcion, the Mayor’s social media liaison, was especially supportive throughout the hackathon. He worked with reporters, photographers, and videographers, wrangling the right people together for interviews. I don’t think he sat down the entire time. None of these people are Justin. Finally, we had to get the food right. We wanted to have as many local vendors at the hackathon as possible. 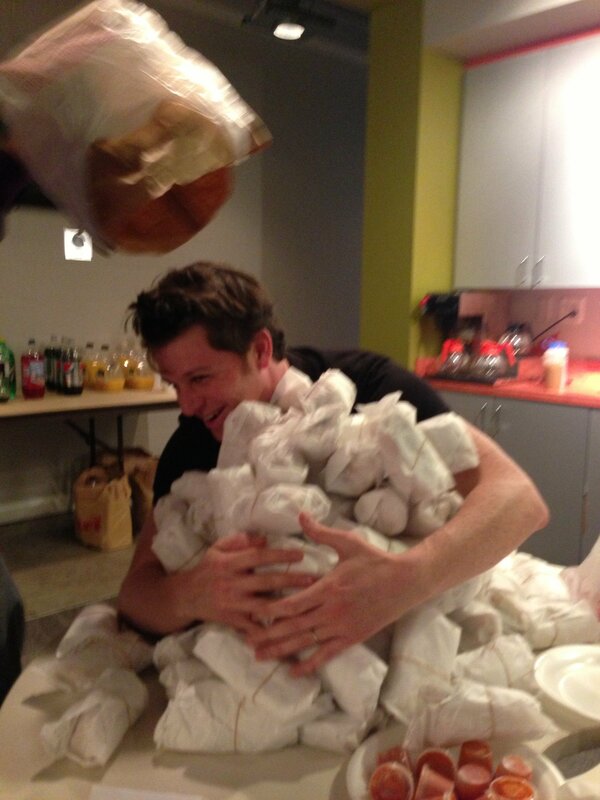 For breakfast, we had a spread from New York Bagels and Katz Coffee. Lunch was a pile of Banh Mi from Les Givrales. Dinner came early from Oh My! Pocket Pies, a food truck that set up in the back parking lot and filled midtown with the smell of fresh empanadas. Thanks to J.R. Cohen, we were able to pull together all of the right people. When it was all said and done, nearly 300 people were at the hackathon throughout the day on Saturday. One of those people was Mayor Annise Parker, who was our surprise guest to kick-off all the demos on Saturday night. Mayor Parker took time out of her personal schedule and sat through all 26 demos with her partner Kathy Hubbard. She was incredibly impressed by the work from all the teams. Our top four teams will present to the Mayor again at the end of this month, but we’re interested in working with all the teams, whether it’s a product for the City or for citizens using City data. Because of the hackathon and the teams that participated, there were many more believers at the City. Some of the judges at the hackathon. Photo by Jose Figueroa. If you’re thinking about running a hackathon in your city, you should know that there are a lot of resources out there to help you. In Houston, we didn’t operate in a vacuum. We had a ton of help from people across the country. How to Run a Hackathon by Socrata provides an overview of the things you need to think about. It’s a great place to start. How do we implement these projects? What will future events look like (hackathons, meetups, Tech Street Houston, etc.)? What is the strategy to tie them together? Should the City host a regular meetup for discussions and continued dialogue? How should we structure a permanent, up-to-date data portal? Can the City’s IT organization support the applications built during the hackathon? Code for America recently moved its blog to a new home. We didn't want to leave anything behind, so we moved this post by Jeff right here. We hope you enjoy it.